Convert WMV to iMovie supported formats including MP4, MOV, M4V and other 1000 video formats. Import and convert iMovie files to WMV without losing quality on Windows/Mac. iMovie is a free video editing application that comes preinstalled on Apple computers, which allows users to create movies from clips obtained from different sources like footage from digital video cameras, downloaded DV-encoded files and photos. If you have WMV videos that you'd like to use in a movie project on iMovie, you might be disappointed to learn that iMovie doesn't support WMV format as it's a proprietary video format developed by Microsoft. If you try to import a WMV file to iMovie, you will likely run into problems such as nothing showing up on the screen, or only image, and sometimes you only get the audio. If you have already tried and failed, don't give up. This article will show you how to convert and import WMV to iMovie with iMovie supported formats on Mac. iMovie supports a wide range of video formats including DV, HDV, AVCHD, Apple Intermediate Codec, Apple Animation Codec, Motion JPEG/A, iFrame, H.264 and most varieties of MP4 and MOV. And you can also take a look at the incompatible formats, which might reminds you of this article if you want to edit MV, AVI, FLV, WebM, DivX, XviD, DVD, VOB, DAV, AVCHD, MTS, M2TS, MOD, TOD, MXF or some types of MP4 and MOV with iMovie. If you are looking for a way to import a WMV file to iMovie, you first need to convert it to an iMovie supported format. To do that, we highly recommend you Wondershare WMV to iMovie Converter, an excellent video converter that converts between over 1000 video and audio formats, including the optimized preset for Apple devices, Blackberry, Zune, Android, video game consoles, YouTube and more. 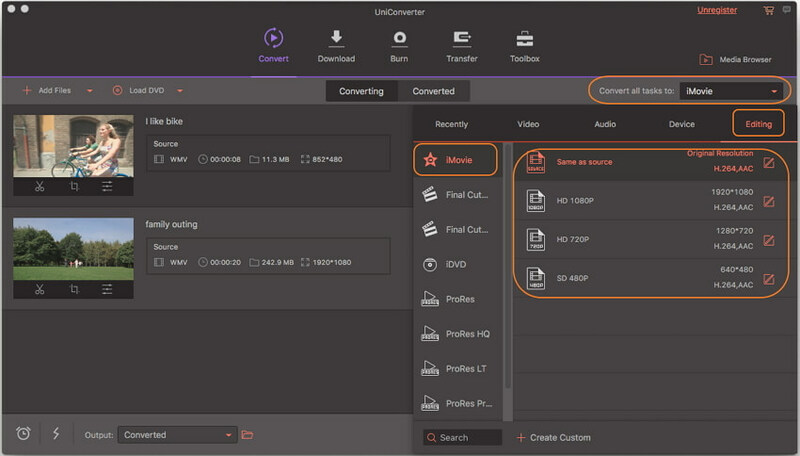 The all-purpose WMV to iMovie converter also features an intuitive interface that convert video files with just a few clicks. 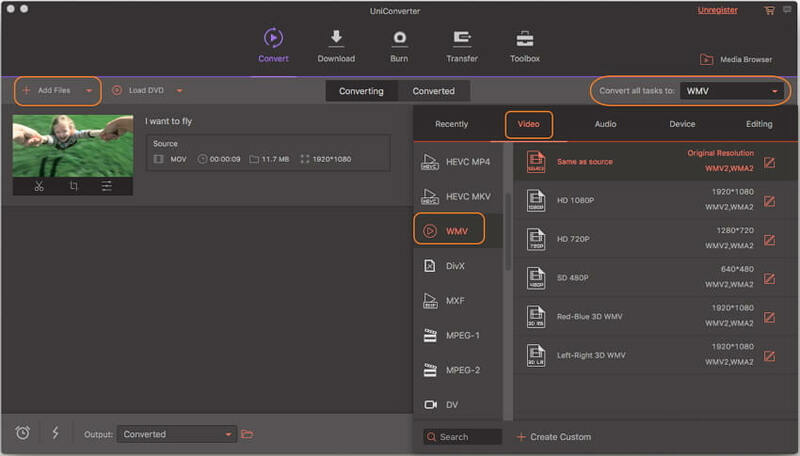 Convert WMV to optimized preset for almost all of the devices, including iMovie, Final Cut Pro, Windows Movie Maker and more. Convert WMV to 1000+ formats, like AVI, MKV, MOV, MP4, etc. Import iMovie files and convert to WMV and other 1000+ video formats without losing quality. Download, install and launch Wondershare WMV to iMovie Converter on your Mac, and click the + Add Files to load the WMV videos that you want to edit in iMovie. You can also direct drag on drop your target WMV files to the program's primary interface. Note: Wondershare WMV to iMovie converter supports batch conversion, so feel free to add more than one WMV video at a time. Go to the Convert all tasks to: section and click the drop-down icon to expand the output format list. Select Editing > iMovie and choose the resolution in the right to confirm the iMovie preset format as the output format. Tips: You can also go to Video > MOV to choose MOV, an iMovie-supported format, as output format. What's more, you can also click the Create Custom to further customize the WMV video. Now just hit the Convert All button to start converting WMV to iMovie compatible format right away. 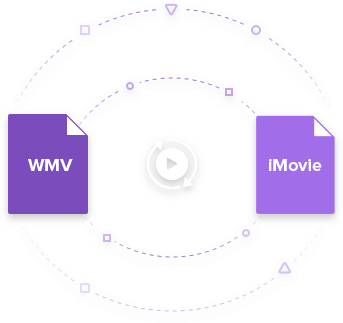 The WMV to iMovie conversion process shouldn't take more than a few minutes, which mainly depends on the length of the WMV video. And you can easily find your converted iMovie videos from the Converted tab. If you're looking for how to convert iMovie to WMV for playing on Windows smoothly, then you can follow the same steps above on your Windows and Mac, just add the iMovie (MOV) file and choose output format as WMV, then start the iMovie to WMV conversion. When Wondershare WMV to iMovie Converter completes the process of converting WMV video to an iMovie compatible format, you can switch to the Converted tab to find the converted WMV videos, which are fully compatible with iMovie. Now your WMV videos are ready to be imported to iMovie. All you need to do are as simple as follows. Launch iMovie and add the converted .wmv files by clicking File >Import > Movies. Highlight select the converted WMV video you want to use in iMovie and confirm adding them to the program. Have fun creating your movie and don't forget to save your project when you are done.